Bad breath can be annoying to downright embarrassing. Most common cause of halitosis (bad breath) is poor oral hygiene. The bacteria that causes odour will break down any food debris left in the teeth. For this reason you have to make sure that you properly clean your mouth since human mouth is a hotspot for bacteria. No one is totally immune to bad breath because it can be caused by the food we eat. Therefore, one must carefully watch his or her diet. There are about 600 kinds of mouth dwelling bacteria so be sure that you will never neglect good oral habits. Good habits always pay off. Causes of bad breath can go beyond teeth and tongue. The smells from your stomach and the foods you eat can find their way to your digestive tract then it will be released as breath. In cases where bad breath is persistent, it generally indicates a more serious health problem. 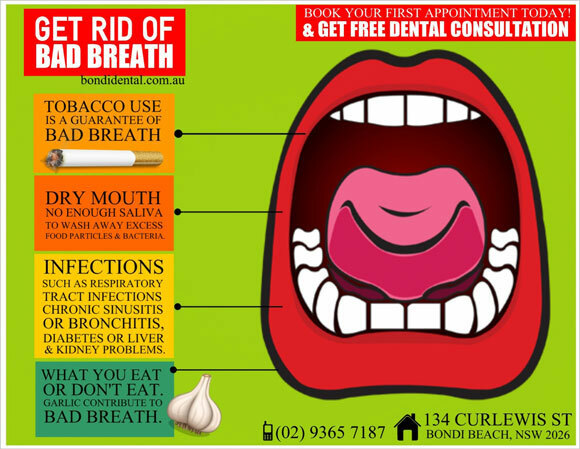 Because bad breath has several causes, it would be best to visit your dentist in Bondi. That way, your Bondi dentist can help you identify the specific cause and know the best way to treat it. Your dentist can also help you maintain good oral health which is your best guard against bad breath. A mint or a piece of gum could mask bad breath but that is just a short term solution and that can never cure the root cause of the issue. One must check several aspects in order to completely resolve the issue. Because every patient’s needs are unique, visiting your dentist in Bondi is still the best way to gain proper guidance about maintaining good oral health. When it comes to safeguarding your oral health, never settle for less; go for a high quality dental service. Your Bondi Dental team is dedicated to providing trustworthy dental treatments. Call us on (02) 9365 7187 or book online and Claim Your FREE Dental Consultation Today!